One Man Two Guvnors by PLOS review. I was invited to attend the UK amateur premier of ‘One Man Two Guvnors’ by PLOS (Putney Light Operatic Society) on Wednesday 19th August 2015. For those of you unfamiliar with the play One Man Two Guvnors is a farce set in Brighton in the 1960’s. It follows easily confused Francis Henshall who ends up in the course of employment of two ‘men,’ or Guvnors. One is Roscoe Crabbe a local gangster who actually died shortly before the play is set and is actually his sister Rachel Crabbe. The other ‘guvnor’ is Rachel’s betrothed, Stanley Stubbers. Mixed in with this we have Pauline Clench who was promised to Roscoe but is now determined to marry amateur actor Alan Dangle and Dolly, Francis’ love interest. The play received critical acclaim so PLOS had big boots to fill. PLOS did not disappoint and once the cast found their feet and we had been introduced to the stars of the show the audience were treated to an enjoyable evening. When I say stars of the show in my opinion Mark Smith who played Francis and Alex Johnson who played Stanley steal the show. Both Mark and Alex were superb in their roles, Mark flung himself around the stage with such energy and managed an impressive sequence of beating himself up. The only criticism I would have for Mark is during the improvised sections and the moments when he addresses the audience it would have been beneficial for some more rapport to have been allowed to build by increasing the interaction, for example in discussing where to take Dolly on a date. This would help contrast the traditional commedia element with the more modern stand up aspect of the show. This was the opening night however and Mark would not have had much a chance to rehearse his patter with a real audience. Alex was perfectly pitched at the posh public school educated man, his accent and mannerisms never faltering. Hannah Pratt played Rachel Crabbe. I would have liked to have seen the nastier side to Rachel, when she was Roscoe in order to have me convinced that he was a known gangster, enough to have many of the characters in the play in fear of him. A similar observation could be made of Dave Jefferies, Charlie Clench- his physicality could have been more imposing to clearly show the audience that he is a gangster, respected enough to be making deals with Roscoe. The show was very slick and the cast seemed to know the production inside out and the lines flowed at a perfect pace, which is vital with a farce such as One Man Two Guvnors. I could sldo clearly hear and understand all of the dialogue. The set design was impressive for a small space and well thought out, turning from Charlie’s House into the Cricketer’s Arm by simply turning the flats around so Marc Torres the set designer must be commended. The construction was also impressive – a pet hate of mine is wobbly flats or doors that do not close properly as this lets down many amateur productions but this set withstood people being flung through the doors and added an extra element to the show. Some of the set changes could have been smoother but as this was opening night I assume this is something that will get smoother as the run progresses. I must also mention the Skiffle Band who played during set changes and in the pre-show. It can’t have been easy to source a Skiffle Band but it fitted in perfectly with the show and was an enjoyable addition. Thank you to PLOS for inviting me to see One Man Two Guvnors – you did the title premier amateur production of One Man Two Guvnors justice. 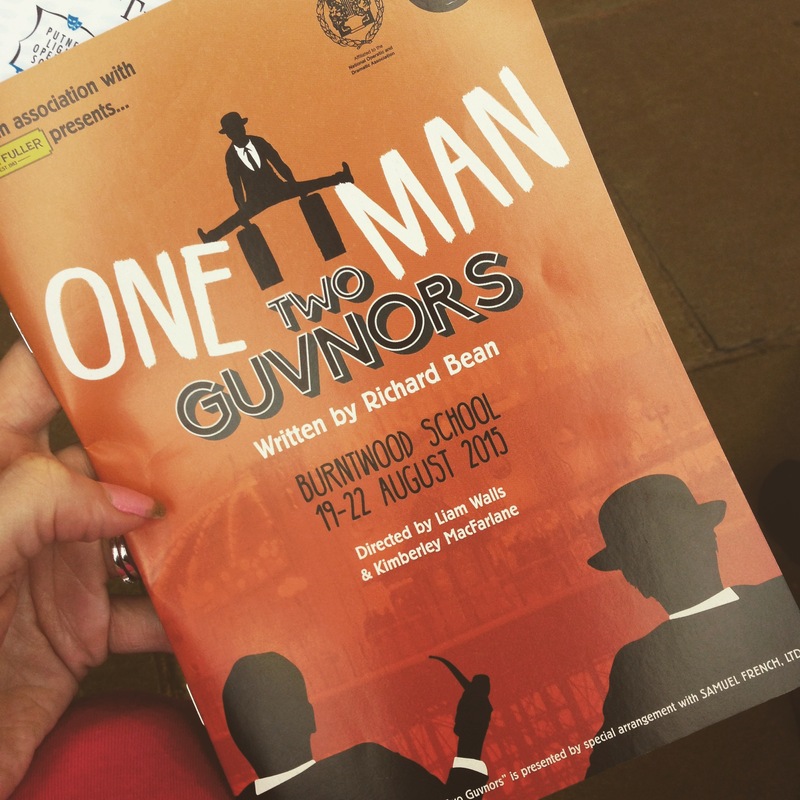 One Man Two Guvnors runs until Saturday 22nd August at Burntwood School. Click here to buy tickets.